With carbon prices and the social cost of carbon on what increasingly looks like a collision course, the entire carbon pricing conversation will change in ways that almost no one had anticipated, and we would be wise to discuss sooner rather than later. Synapse Economics is a consulting firm that issues an annual carbon price forecast. Its 2016 forecast is shown below, illustrating Low, Mid and High cases. The forecasts basically assume no carbon price for the next several years because the Clean Power Plan won’t kick in significantly until then. After that the forecasts diverge significantly out to 2050. The Low forecast never gets above $40 (all 2015 dollars, by the way), the Mid forecast reaches $81, and the High forecast tops off at $110. It’s worth noting that the Synapse report also shows a range of electric utilities’ carbon forecasts; they’re almost universally less than the Synapse Low case. Carbon prices are usually set legislatively (as in the case of a carbon tax, which would be implemented through statute), or reflect supply and demand in carbon markets. Carbon price forecasts thus are extremely sensitive to assumptions about future policy trends and mandates. They’re also sensitive to political decisions about the structure of carbon markets (e.g., the ability to use offsets and other cost-reducing measures). The Social Cost of Carbon is entirely different, and is intended to quantify the economic damage done by each individual ton of emitted CO2. The SCC is based on complicated yet highly simplified economic models called Integrated Assessment Models, and estimates of the Social Cost of Carbon vary widely (literally from less than $0 to hundreds of $/ton). Economists have debated SCC values for decades, but it was only recently that the US government specified an SCC value for federal regulatory rulemaking purposes. The National Environmental Policy Act requires that federal rulemakings be subject to a cost-benefit analysis, and after the courts ruled that climate change couldn’t be ignored in the analyses, e.g. an SCC of $0, coming up with a federal SCC was seen as a way to standardize how climate change would be handled going forward in widely varying regulatory proceedings. Following the work of an Interagency Task Force, the Office of Management and Budget approved a specific SCC that currently is set at $41/ton. The price escalates every year going forward (based on the assumption that the amount of damage being done by each ton goes up as the concentration of CO2 in the atmosphere increases). The Synapse Economics report includes a chart of the federal SCC. It is the purple line in the figure below, and is based on using a 3% discount rate to value future damages. The other lines reflect SCC calculations based on different assumptions and risk adversity, but are not the official federal SCC. You can see that the official SCC goes from today’s value of about $41 to more than $50 by 2035 and to $71 by 2050. Historically, carbon price forecasts have not had anything to do with the SCC. With carbon price forecasts based largely on policy assumptions, and the only “official” US SCC limited to a very narrow cost-benefit role in federal regulatory rule-making, the two numbers were largely isolated from each other. In April 2016 an administrative law judge in Minnesota ruled that the federal SCC was an appropriate externality value to use for Minnesota’s electric utility planning. The ruling was in response to an effort by utilities and coal companies to get the SCC-based externality value reversed. Using the SCC as an externality value for utility plan is a seemingly logical application of the idea of the SCC, but it’s a significant departure from the specific role for which the federal SCC was developed and approved. Early this month, the Public Services Commission of NY approved an SCC-based price floor for electricity coming from the state’s nuclear power plants. The idea behind this action is that it makes little sense to allow natural gas to displace nuclear power unless you have taken into account the economics of the CO2 damages associated with natural gas power. Again, this seems to be a logical way to use the SCC —but it’s a huge departure from the SCC’s federal rulemaking roots. The question of whether the official SCC number would stand up to a court challenge has hung over these and other initiatives. Just this week, however, the situation has changed. On August 8, 2016, a federal court of appeals upheld federal energy efficiency standards that included reliance on the federal SCC value. The Court found that the Department of Energy’s use of the SCC was not arbitrary and capricious and was within the agency’s authority. This is the first time that the SCC has been challenged and upheld in the courts. The outcome was by no means guaranteed, given the complexity of SCC methodologies. So within the space of just a few months, the SCC has been upheld in court, and its role has been extended to very different energy decision-making purposes at the state level. The federal SCC is increasingly being seen and deployed as a defensible representation of the economic damages being done by CO2 emissions. This is a big issue for carbon pricing for two reasons. The first relates to the fact that many economists believe that the way the federal SCC was calculated leads to too low a value. In practical terms, for example, an SCC of $41/ton will not have much impact on transportation sector decision-making, where gasoline prices routinely fluctuate by the equivalent of a $100/ton SCC (e.g. $1/gallon). I discussed this briefly in my earlier blog post. To understand the second reason, go back and take a look at the two figures included above. Note that all the carbon price forecasts are substantially below the SCC for at least the next couple of decades. 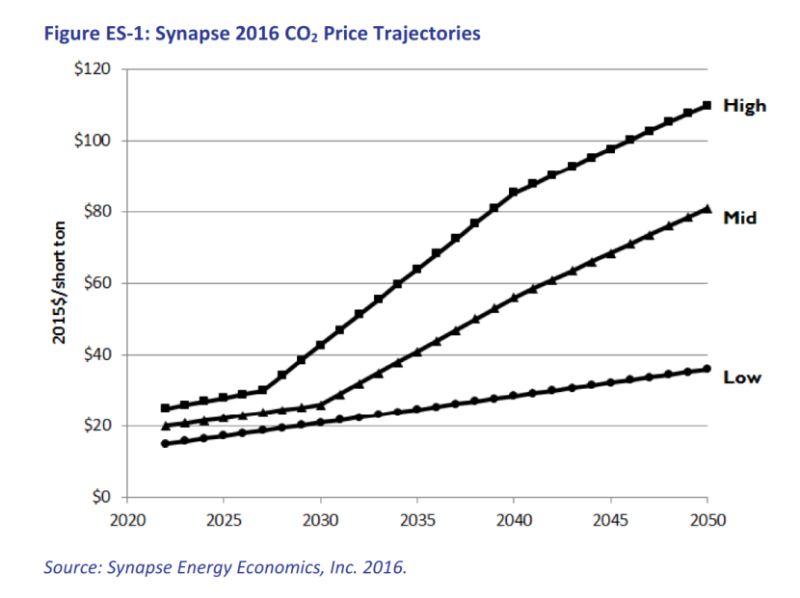 Synapse Economics’ Low price forecast never even gets close to the SCC value (which means that utility price forecasts don’t either). As long as carbon prices and the SCC were kept apart this wasn’t as likely to happen. And we can argue all we want that the numbers are still unrelated. We can argue that the actual price of carbon is set by market forces. We can argue that a market-based carbon price leads to the most efficient emissions reduction outcomes. But if everyone agrees that the SCC is the right proxy for the economic damages being done by each and every ton of CO2 emitted, which is the unavoidable implication as the SCC extends into state-level decision-making, how can it remain politically viable to issue free emissions allowances to utilities, or have officially sanctioned carbon prices that are far below the official SCC value? How could a carbon market price generating a $15/ton carbon value be justified? Critics will argue, for example, that even if you favor market mechanisms, mandated reductions should be significant enough to generate a carbon price at least equal to the official SCC. 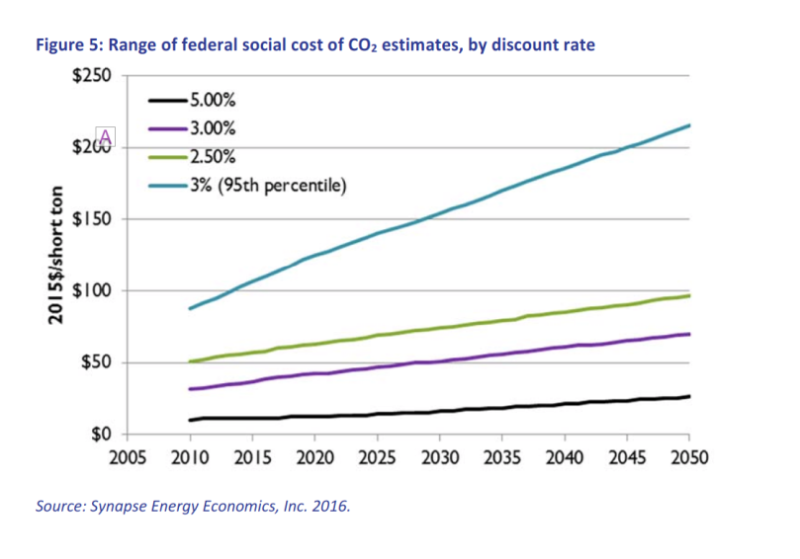 By association, how can utilities justify a carbon price forecast of $10 per ton in 2020, when the social cost of carbon will be almost $50? It’s hard to come up with a spin that sounds particularly good, and I can see the litigation possibilities already. For many years, carbon price forecasts and Social Cost of Carbon estimates were ships passing in the night. But with developments in the last few weeks the SCC and policy-generated carbon prices look likely to collide. Politically and economically, it’s not beyond the pail to see the SCC becoming a floor price for carbon in market mechanisms, and an across the board emissions fee for CO2 emitters; the electricity sector implications would be dramatic, to say the least. With carbon prices and the SCC on what increasingly looks like a collision course, the entire carbon pricing conversation will change in ways that almost no one had anticipated. This does raise a “Houston We Have a Problem” kind of situation that we would be wise to discuss sooner rather than later.